Nelsons have promoted three employees to Associates in their Children and Family, Commercial Property and Medical Negligence teams. 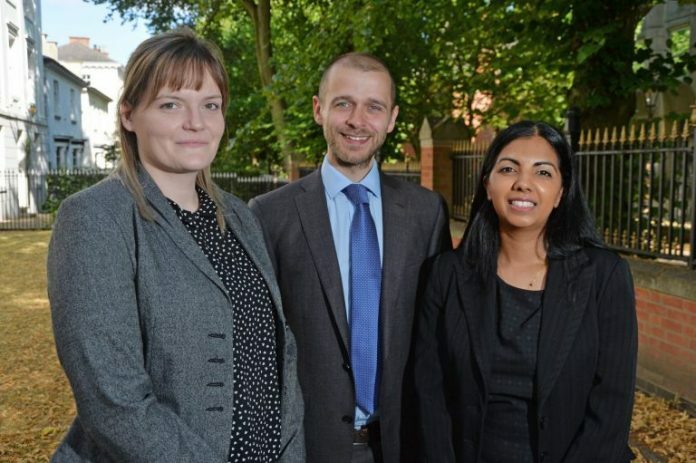 Peter Rees, Priti Vadgama and Danielle Young have collectively worked at Nelsons‘ Leicester office for more than 14 years and are delighted their efforts and dedication have been recognised. Commercial Property specialist Peter, who qualified as a solicitor in 2014, has particular expertise in secured lending, acquisitions and disposals and development projects. He says: “Nelsons has a great reputation – along with a fantastic range and breadth of experience in different sectors and areas of law – so I was keen to undertake my training contract at the firm. I am very proud to have developed my career here. Priti, a member of the Law Society’s Children and Family Panels, joined Nelsons in 2017 and has developed her expertise in children law, including advising on care and private children proceedings, as well as domestic violence. She says: “I am delighted to have been promoted to Associate and to have been recognised for the hard work and dedication I have put into my role since joining Nelsons last year. Danielle, who specialises in advising on medical negligence claims and inquests, joined Nelsons as a Paralegal in 2011, before qualifying as a solicitor four years later. She says: “I am very proud have worked my way through the ranks in the medical negligence team at Nelsons, which has a fantastic reputation in the legal sector. In the type of work I do, I get a real sense of helping people and enjoy building long-standing and strong relationships with clients.